Perfect for scenery lovers, this 4 bedroom villa has the most amazing views of the open countryside and Montgo Mountain. The private pool takes pride of place where you can spend lazy days enjoying this spectacular setting. 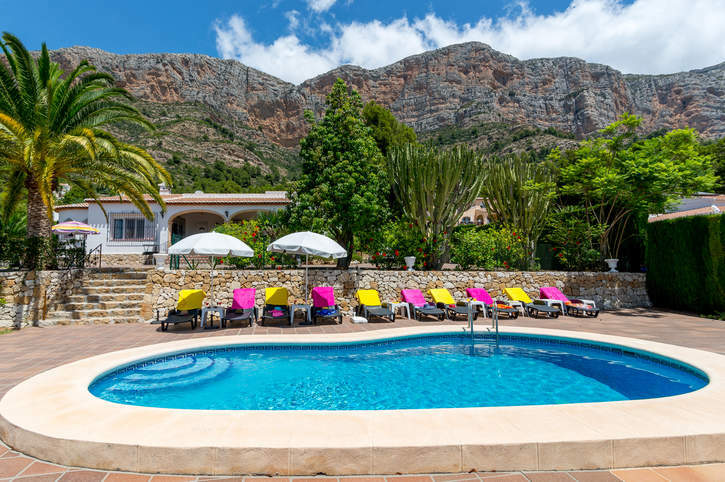 Located in Javea, the villa is around a 15 minute drive to the endless choice of shops, bars, restaurants and the beautiful sandy Arenal Beach. WiFi, air conditioning/heating in the bedrooms and pool heating are included. A wonderful countryside setting with fabulous views of the Montgo Mountain - you'll feel like you're in your own Spanish haven! The highlight of this villa has to be private pool with breath-taking views of the countryside and mountain range. There's also a spacious pool terrace and lawned area that is dotted with sun loungers for relaxing. A few steps lead to the open terrace, which sweeps all around the villa. There is a dining table and chairs, as well as the BBQ - all you need for dining alfresco. A further few steps lead to the covered terrace with a wicker seating set where you can enjoy the superb scenery. There is a gated driveway and ample parking for up to 4 hire cars. A few steps lead to the covered terrace where the front door is located. The lounge/dining area is decorated in neutral tones, creating a feel of calm and relaxation. You'll find a large window, allowing the natural light to flow through. There are sofas, a flat screen TV and an ornamental fireplace. An archway from the lounge leads to the dining table and chairs. Adjacent is the well-equipped kitchen and utility room. There are 2 double bedrooms, one with an en suite bathroom. In addition, there are 2 twin bedrooms, one with an en suite shower room and patio doors leading to the open terrace. There is also a separate shower room. All bedrooms are spacious and come with ample storage space. This villa is registered and licenced by the Generalitat Valenciana to comply with local legislation on holiday rentals. This number is: VT-470878-A. Set in an elevated position, Villa Leo is set against an impressive backdrop - the Montgo Mountain! Located in the resort of Javea, the historical old town is around a 15 minute car journey away. Why not explore the quaint shops, bars and restaurants at your leisure? A further short drive, and you'll reach the beautiful, Arenal Beach in Javea which is great for a fun day out by the sea! Javea has an open air market every Thursday and there's also one in Moraira on a Fridays. You can buy local produce from hand bags or belts through to fruit and vegetables. You'll also find an undercover market open every week day in the mornings, which can be found by the church in the old town of Javea. Javea offers something for every taste from authentic Spanish food to burgers and chips! Choose from many restaurants along the Arenal Beach or wander down to the port and eat dinner at the marina overlooking the boats. The old town has lots of little lanes with restaurants hidden away for you to explore. The sandy Arenal Beach is marvellous for children with its shallow waters and plenty of scope for sand castle competitions. There are lots of different water sports on offer too. There's a great selection of bars, shops and restaurants just a stone's throw away from the beach. Javea offers various kinds of activities for all the family to enjoy. There is crazy golf, go-karting, horse riding, tennis, paddle tennis (a cross between tennis and squash), to name but a few. For those seeking thrills and adventure, then a trip to one of the theme parks in Benidorm is for you. Be it roller coasters, water rides or a wander around the zoo. Javea is set between Alicante and Valencia, both of which are great for a day out. Or, try a trip to the iconic Guadalest. The Montgo Mountain gives Javea its own micro-climate and has marked walks across the valley. For the more adventurous you can go right up to the top of the mountain! There are 2 golf courses on the outskirts of Javea - Club de Golf Javea, which is a 9-hole course with a great restaurant overlooking it, or the Marriott Golf and Spa resort on the road to Denia. Villa Leo is not available to book for season as it is sold out. Take a look here at the Costa Blanca villas that are currently on sale. A good holiday, with stunning views from the villa. We liked the villa and would definitely book there again. We had a good holiday and generally liked a lot about the villa - its layout, size, location. Beautiful surroundings, spacious villa, good-sized pool. Car essential, but everywhere within easy reach. Overall, we enjoyed staying at this villa and it was a good location for a quiet holiday. The setting of the villa in terms of views and the location being close to some very good restaurants, was excellent.